FILE - The Dave Johnson coal-fired power plant is silhouetted against the morning sun in Glenrock, Wyoming. "I'm not going to put the country out of business trying to maintain certain standards that probably don't matter," President Donald Trump told VOA when asked about the economic impacts of climate change. climate change essentially comes down to three arguments: the United States has already cut its greenhouse gas emissions more than other countries, regardless of any international agreement; regulations to cut emissions come with high costs and few benefits; and those regulations would put the United States at a disadvantage because other countries will not follow. "When you look at China, and when you look at other countries where they have foul air," Trump added, "we're going to be clean, but they're not, and it costs a lot of money." As U.N. climate negotiations get under way in Poland to work out rules for implementing the Paris climate agreement -- from which Trump intends to withdraw the United States -- experts weigh in on the administration's claims. 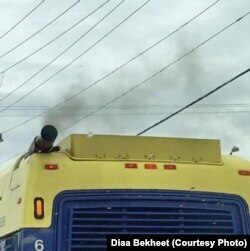 A bus gives off exhaust fumes in Alexandria, Virginia. (Photo by Diaa Bekheet). It's true that the United States has reduced its greenhouse gas production more than any other country. U.S. emissions peaked in 2005. In the last decade, they have fallen by about 13 percent, according to the BP Statistical Review of World Energy. But the United States was the world's leading producer of greenhouse gases until 2006. And, others have made bigger cuts by percentage. Hungary's levels, for example, decreased 14 percent. U.S. emissions started to fall when the fracking boom took off. The new technique of hydraulic fracturing turned the United States into a major natural gas producer. As the price of natural gas has dropped, it has been steadily replacing coal as the dominant fuel for electricity generation. Because burning natural gas produces far less carbon dioxide than coal, greenhouse gas emissions have decreased. More recently, renewable sources such as solar and wind power have started to make inroads on the power grid. While U.S. emissions have fallen since the 2000s, China's have soared. The country pursued astonishing economic growth with an enormous investment in coal-fired power plants. China is now the leading producer of greenhouse gases by far, roughly doubling U.S. output. Trump has argued that regulations aimed at limiting greenhouse gas emissions would hobble the U.S. economy. He has moved to undo the Obama administration's proposed rules on carbon dioxide emissions from power plants and efficiency standards for vehicles and appliances, among others. Critics question whether those regulations would cost as much Trump suggests. "None of these policies were going to have dramatic increases in the prices that consumers would see," Duke University public policy professor Billy Pizer said. He added that normal price swings would likely swamp the cost of the regulations Trump targets. The emissions reductions the Obama administration pledged in Paris "were built largely on a continuation of the coal-to-gas transition and a continuation of growth in renewable energy that's already happening," said Alex Trembath of the Breakthrough Institute research center. As such, he added, they "don't imply a large cost. In fact, they imply a marginal increased benefit to the U.S."
Those benefits come, for example, because burning less coal produces less air pollution, which lowers health costs. Not to mention the direct results of climate change: wildfires, floods, droughts and so on. "We have enough science and enough economics to show that there are damages resulting from us releasing CO2 into the atmosphere. We know that that is not a free thing," University of Chicago public policy professor Amir Jina said. "And yet, we are artificially setting it as free because we're not paying the price of that externality." He said economists nearly unanimously support a carbon tax, a cap-and-trade program or some other way to put a price on carbon emissions. Few nations have taken the necessary steps to meet the emissions reduction pledges they made in Paris, according to the most recent United Nations emissions gap report. Even those pledges would fall far short of the Paris goal of limiting global warming below 2 degrees Celsius, the report adds. Reaching that target will take "unprecedented and urgent action." A 2016 report said an additional $5.2 trillion investment in renewable energy will be necessary worldwide over the next 25 years. Trump's statement -- "we're going to be clean, but they're not, and it costs a lot of money" -- sums up why nations are reluctant to act: no one wants to take on burdens that they think others won't. "It's the thing which has been dogging action on climate change for generations," Jina said. "We only really solve the problem if everybody acts together," he added. "And if enough people are not acting, then we don't." Paris depends on countries following through on increasingly ambitious emissions cuts. Each country decides what it is willing to do. Every five years, countries come together and show their progress. "You over time build confidence in each other," Pizer said. "Ideally, you ratchet up the commitments as you see your actions reciprocated by other countries." Trump's backpedaling on the U.S. commitment raises questions about the prospects. However, the first of these check-ins is five years away. Trump can't formally withdraw the United States from the agreement until 2020. Pizer notes that the predecessor to the Paris Agreement, the Kyoto Protocol, failed in part because it imposed caps on countries' carbon emissions, and most of the world balked. "In my mind, this is the best we can do," he said. "If there were a different way to do it, I'd be all over that."